Where do I use my Shoes International voucher code? Choose a voucher from us, click ‘Get Code’ to view the discount code and the Shoes International website will open in a new window. Copy the code that appears and click on our link to the Shoes International website. Browse the site and click ‘Add to Basket’ on the products you'd like that can be bought with your discount. When you’re ready to buy, click the shopping basket link at the top of the website. On the shopping basket page, you’ll see a ‘Discount Codes’ box underneath your items. Paste your code into here and click ‘Apply Voucher’. Enter your email on the homepage and subscribe to the newsletter, as they will often send a discount voucher you can use on your next order. When shopping for a new pair of stylish and comfortable shoes at Shoes International, remember to check out our discount codes before you buy and grab a bargain on your order. 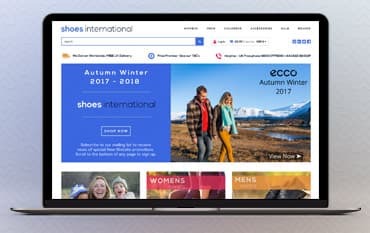 Simply browse our Shoes International deals page above and choose from all the biggest discounts and latest promotions available, these include sales, offers and deals that can all save you money across the Shoes International store. With the help of us you thrifty shoe shoppers out there can find yourself saving a fortune, no matter what buy! Discover an extensive range of brands featuring styles for all women of all ages and tastes. Find materials and colours for every occasion at very competitive prices that ensure you look good while spending less. Find boots, heels, slippers, wellies, casuals, walking and hiking shoes, sports shoes and footwear accessories in the women's category at Shoes International. You can also enjoy footwear from big brands like Dr Martens, Joules, Ecco and Van Dal and can rest assured that the shoes you buy from here will be made with high-quality materials and excellent craftsmanship. For savings on women's shoes check out the sale section where there are tonnes of discounts, or you can browse our exclusive codes and deals that can help save you money on your purchase! Shoes International don't just cater for women, they also have a great men's section where you can find all different styles of men's shoes from big, UK and international brands like Dr Martens, Barker, Rieker and more. At Shoes International you'll find a collection of styles in men's shoes for every occasion including boots, formals, casuals, slippers, walking and hiking shoes and sports shoes. Designed in a selection of upper materials and sole units, available at competitive prices, footwear at Shoes International is guaranteed to bring you the ultimate comfort and perfect style at affordable costs. We offer free UK delivery on all footwear, luggage and large accessories. Small accessories are delivered free if ordered together with footwear or other large accessories. Footwear is normally dipatched on receipt of your order. If we do not have it in stock, within 3-5 days and if the manufacturer is also out of stock, we will advise you of the expected date. In the UK, you can return an item for free, using the envelope supplied. Outside the UK, you will need to pay the return costs. If the goods are unsuitable e.g. wrong colour or size, we will refund the full purchase price but are unable to do so if there are any signs of wear. If you require a full refund also return any complimentary items such as tie, polish or shoe trees. Shoes are definitely worth the investment as they provide comfort, fashion, and function. You can find the best shoes coming from a variety of popular brands through Shoes International. Use a Shoes International voucher code and save on a wide selection of men's and women's shoes. Whoever you are buying shoes for in the family you are sure to find the perfect pair at Shoes International, with a huge variety of shoes available in a whole host of colours and styles.